Every once in a while, we get to step back and see the progress we've made growing the business into one of the leading waterproofing companies in the northeast region. While we don't work for accolades, it sure is nice to occasionally get them. Here's the full text of a letter we received from one of our suppliers - Cosella-Dorken Products, Inc. I would like to extend my gratitude and appreciation to National American Waterproofing for the outstanding workmanship conducted year-after-year as a Certified Installer of our DELTA®-MS waterproofing system for foundations. Thus far you have seamlessly installed over 1,500,000 square feet of DELTA®-MS; every one of your installations produced superior quality and attention to detail. National American Waterproofing is without a doubt a key component in our success in the market place. Thank you very much for all your great work! No problem, Chad! We look forward to many more years working together helping our clients alleviate their water issues. 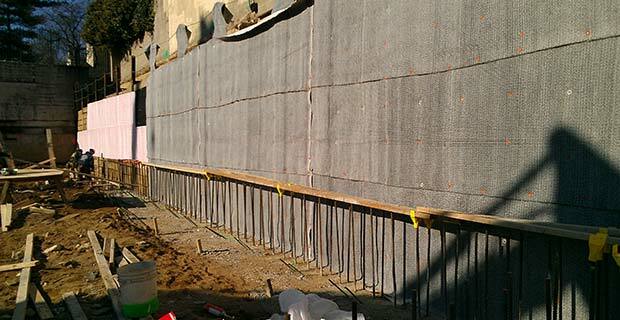 National/American Waterproofing expands into the Weather Resistant Barrier (WRB) market. The builder of this 10,000 square foot home in New Jersey contracted with us to install an above grade fluid applied WRB as an alternative to conventional housewrap products. The membrane reduces air infiltration through the exterior walls providing a more comfortable and energy efficient home. The fluid applied WRB protects the sheathing creating a more efficient and sustainable building envelope. 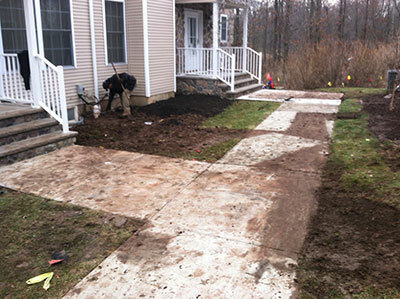 Despite harsh winter weather conditions, we completed this work in three days. National/American was contracted to diagnose and provide a solution to a recurring foundation wall leak on a townhouse building in Central New Jersey. The repair was a turnkey operation from design, utility mark-outs, waterproofing and drainage repairs to excavation and backfilling. Working within a two-day weather window we repaired faulty waterproofing, removed a former repair, replaced footing drains, sealed utility penetrations and reconfigured underground leader pipes. 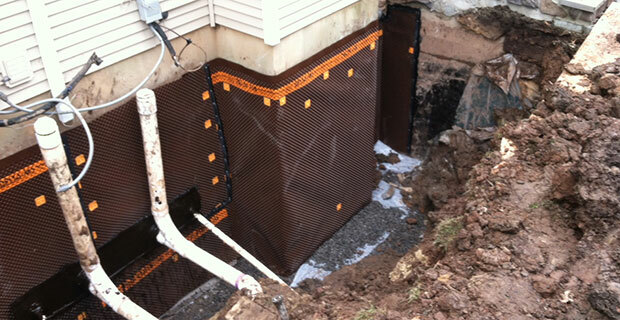 This precision excavation is a precursor to dozens of interior basement repairs. At National/American Water Management, we’re involved in projects both big and small. This one? It’s a big one. We’re installing CETCO Voltex DS bentonite geotextile waterproofing system on a Toll Brothers City Living project in downtown Philadelphia. Our experience and efficiency enabled us to work on this fast-paced work site. The Voltex product is one of many waterproofing products we install on a daily basis on projects throughout the Tri-State area. If you’re in the planning stages of a similar development project and are looking for the best waterproofers in the business, please contact us.